Home / Who We Are / Wanna Help? A collection of people crafting an intentional community and annually creating an amazing Burningman theme camp. Who We Are Well, whoever we are we're too varied and random to fit into a simple explanation. We used to be Bluehouse but we changed our name in 2005 and have been Shady Asylum ever since. With members from all over the globe most of us tend to live in or around Seattle or Portland , but we have inmates from Minnesota , Kentucky, Korea, France, Australia , and just about everywhere else you can imagine. Every year's camp includes crusty veterans as well as those treasured virgins working together to bring shaded grass to Black Rock City. Shady Tower is our primary gift to the playa, and she's a three sided pyramid 60 feet on a side and 24 feet tall made of shade cloth and floored with live grass. Bringing a peaceful daytime oasis and perfect place for the creation of community to the playa for seven years we're looking forward to 2007. We love hosting weddings, story telling, existential cheerleaders, and your special event that just cries to be on grass on playa. Drop us a line for more information. When it isn't Burn season we spend our time doing most anything you can imagine that doesn't involve court dates and not getting caught at the rest. Camp Expectations There is very little all of us can agree to, and here's the list. Each year we make a set of camp expectations and then hold ourselves to them. Here's our first draft of the 2007 set, for our own and your reference. We will treat ourselves and each other well. We will clean up after ourselves, hauling our own trash home. Each person within our camp is expected to be autonomous. Do what you need to do to be happy, healthy, and sane. Personal space is constructed, and personal needs met, before we work on camp projects. No Martyrs. The camp experience should not ruin the burn experience. There is a hammer down time, at which point the projects are as good as we can make 'em and all other work is optional. We all have a right to have fun. All camp projects go through the same process. Camp fees refunds, for whatever reason, are optional and not to be expected. Those who participate (presence, email, phone) make the decisions. Shady Tower is our priority project. 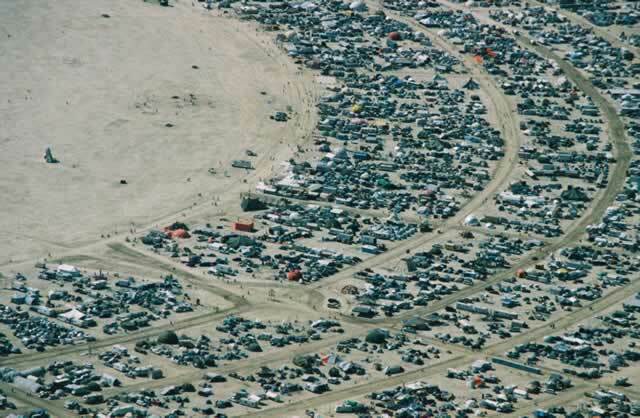 As you can imagine bringing five tons of sod to the playa, keeping it healthy and green, and then carting it away is no light logistical feet. Every year camp costs thousands of dollars to pull off and we can use all the help we can get. If you're going to the burn and want to talk about camping with us drop us a line and we can chat for a while to see if there's a good fit. Odds are as long as those expectations look like something you can live with, and you've got something of a sense of adventure, we're gonna get along fine.